Today kicks off Computer Science Education Week! Held every December in honor of the computer science pioneer Admiral Grace Hopper, this global grassroots movement is designed to raise awareness and encourage computer science education. 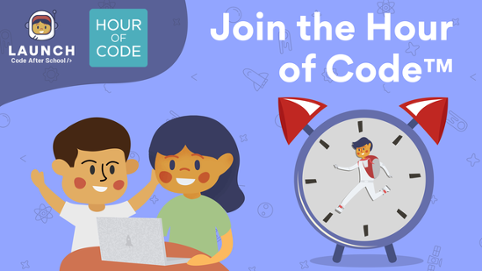 Every Computer Science Education Week, Code.org organizes the Hour of CodeTM to get kids around the world coding for at least 1 hour during the week, a mission close to our hearts at Launch. To make the most of the week and take advantage of the Hour of CodeTM movement, we’ve collected compiled you need to know in one place! The Hour of CodeTM is a great way for a child to dip their toes into coding. Browse Code.org’s free kids coding languages activities here to choose one to work through with your child. Want to get more involved with your child education? Some schools need volunteers to help with activities! Check the map of schools who have registered to participate with at least an hour of coding to see if your child’s school is represented. In the Austin area? Come by Launch this week to take advantage of our free coding sessions! Our teachers are geared up for the Hour of Code with Chromebooks, unique coding programs and intimate instruction for each student. Being built on the “flipped” classroom model that HOC is designed for, Launch allows students to progress at their own pace, with experienced teachers available to help at every step. Choose an hour this week to participate in the national movement!